According to Larousse (page 212), the original Charlotte dessert was inspired by the English summer pudding and was created to honour Queen Charlotte. It was made with a thick apple purée, flavoured with lemon and cinnamon and poured into a mould lined with bread and then baked. It was served warm with a cold custard cream. Carême created the Charlotte à la Parisienne, an uncooked dessert making use of bavarois and lady fingers. This dessert became known as the Charlotte Russe when all things Russian became fashionable in Paris. The recipe for the Charlotte Russe looks long and complicated. I would save this dessert for when you have guests as it is very impressive. It does not take that long to make, but remember it needs an overnight stay in the fridge to set properly. The first time I saw a Charlotte was on the Great British Bake Off. Mary Berry’s recipe uses a Swiss roll filled with jam. The Swiss roll is cut up and used to line the mould. The sponge fingers are a pleasure to make, if your piping skills are average as mine are. The nice thing is that they can be kept in an airtight container for a week so I made these well in advance. 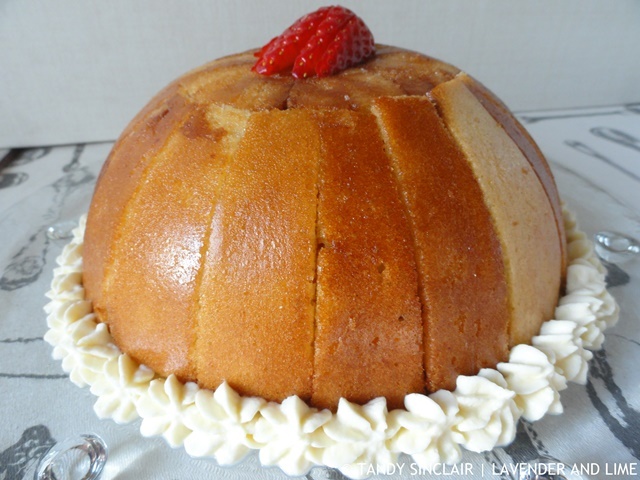 Rich Bavarian cream encased in sponge with a hint of liqueur - a perfect dessert for dinner guests. Oooh la la! Lovely looking cake Tandy. Despite what you say, there’s a bit of effort there. It’s probably low on my ‘to make’ list, but you never know! Yep – definitely one for entertaining but it does looks fabulous. Love the sound of the original version using apple puree – must do a bit more research on that – thanks Tandy. Wow!! This is so pretty! I’ve never had it before, but it sure does look delicious!! What a great recipe! Thanks so much for sharing! What a beautiful dessert. Since you have indicated it doesn’t take as long as the recipe looks, I will have to give it a try. It does look like it would be impressive for guests, and I love that it has to be made in advance! I don’t believe I have ever even heard of this dessert. It’s lovely. This looks amazing! I bet it goes perfect with my morning coffee. I’ve never had a Charlotte Russe before, but now I must try one!! Never had this before, tempting to try!!! Tandy – wow – this is so incredibly elegant! This would indeed be perfect for guests – but, I am not so sure I’d like to share it! Love the sound of the Bavarian Cream. Have a great day Tandy. Your Charlotte Russe has stunning visual appeal. Those sponge fingers are to die for! I love the Great British Bake Off and Mary Berry, I had to watch online as it wasn’t available here. So entertaining, couldn’t stop watching. Saw her Swiss Roll episode too =) I’m half Russian so I should most definitely appreciate this dessert. Have a great week!